My friends, the Trump campaign has decided to go full Jared Leto Joker. It’s all so very deeply ... twisted. Now that Paul Ryan has distanced himself from Trump as much as he possibly can without actually taking any sort of real stand, Donald Trump has apparently been give the green light to lose his goddamned mind. Trump’s first tweet this morning came from an iPhone—which is to say, not from Donald Trump himself. His members went wild! Congress shrieked! Louie Gohmert started eating glass! 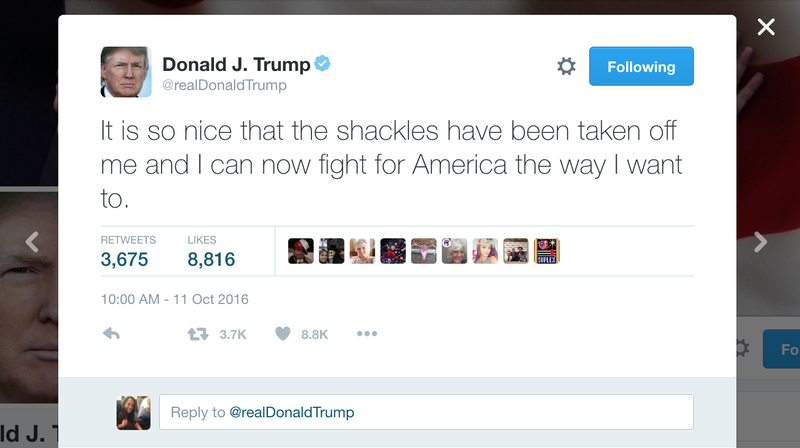 Shackles is not a very Trumpian word, nor would Trump admit to having ever been so neutered by the GOP. It is, however, very much in the lexicon of crazed speechwriter Stephen Miller or former Breitbart man Steve Bannon. In other news, instead of “Tiny Dancer” on loop for three hours at every rally, Donald Trump will be now storm on stage to this.